Printed by photographer on recto of photograph: "Div. III West Burnaby School. Sept 21. 1910 / Barrowclough Cards Vancouver BC". Photographic postcard of Division III at West Burnaby School (later renamed Kingsway West school). 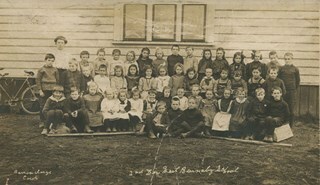 There are twenty-two boys and fifteen girls seated in three rows, with their teacher, Miss Annie Forrest standing in the centre at the back. John Rumble is sitting in the front row, wearing a "Peter Pan collar." For additional copies of photographs of this group, see BV994.21.2 and BV999.2.40. Additional copies of photographs of this group are held in the collection as BV994.2.2 and BV999.2.40. Photographic postcard of Division III at West Burnaby School (later known as Kingsway West school). 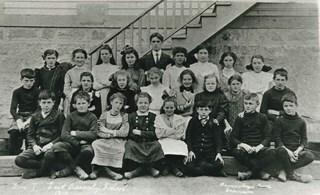 There are twenty-two boys and fifteen girls seated in three rows, with their teacher, Miss Annie Forrest standing in the centre at the back. John Rumble is sitting in the front row, wearing a "Peter Pan collar." Additional copies of photographs of this group are held in the collection as BV994.2.2 and BV999.2.39. Photograph of Division III at West Burnaby School (later renamed Kingsway West school). 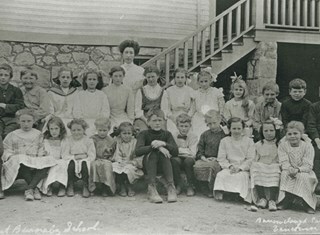 There are twenty-two boys and fifteen girls seated in three rows, with their teacher, Miss Annie Forrest standing in the centre at the back. John Rumble is sitting in the front row, wearing a "Peter Pan collar." 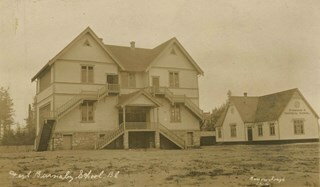 Photographic postcard of Division II at West Burnaby School (later renamed Kingsway West School) sitting and standing outside. Standing in the back on the far left is John Robertson, fourth from the left is Lillian Bond, beside her is [first name unknown] Barber, Eva Coburne, Mabel Ralph, [first name unknown] Bramble, George Robertson, Mabel Rowlinson, unidentified, Georgina Bell, Bright Robertson and Fred Bond. Fourth from the left in the second row is Glen McMaster, sixth is Lois Rumble (later Wilson), beside her is Margaret Creamer, Gladys Bisset, Amy Sandell, unidentified, Elgin Robertson, unidentified and Bill Smith. Sitting in the front row, third from the left is Goldie Ralph, beside her is Edith Marten, unidentified, Jessie Robertson, [first name unknown] McMaster, Grace Marten, Elsie Wilson, Beatrice Barber, Dora Barber, Jean Ross and Dolly Smith. Miss Annie Theresa Forrest is standing on the far left behind her students (next to her is a partially visible bicycle). Note in black ink on verso of photograph reads: "1907"
Note in pencil on border on verso of photograph reads: "19 absent."